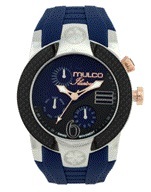 Turning illusion into reality, Mulco Watches Inc. recently launched its new Illusion Crescent watch collection. With a sophisticated and sleek style, the new collection of nine watches includes a calendar and unique combination of mixed materials. The latest creation from Mulco, the Illusion Crescent collection is uniquely characterized by mixing materials such as carbon fiber, different types of metals, various numbering styles and the watch maker’s famous silicone band together into one showcase timepiece. The combination of regular and Roman numbers offers stylish innovation; the watches also hint at a timeless romanticism and they retail for $465. In addition to Illusion Crescent collection, Mulco also launched two other new collections for spring: the Fondo Full and the Fondo Wheel. Mulco Watches Inc. crafts unique timepieces with vibrant colors and original textures designed to create a new and fresh statement in the luxury watch industry. However, trendsetting is just the beginning for Mulco. The fine Swiss movement watches are also all hand-assembled for stunning perfection. Mulco designers and technicians carefully work with fine and complex materials, including aluminum, silicone, stainless steel and ceramic to create exquisite and timeless masterpieces. The fast-growing Mulco Watches Inc. was established in Switzerland in 1958 and later acquired in 2006 by visionary entrepreneurs with extensive experience in the watch industry. Mulco was subsequently re-launched, revealing a brand new look with much edgier sophistication, setting the pace for new fashion trends. Style, elegance and quality are quintessential hallmarks for the firm’s unique collections. 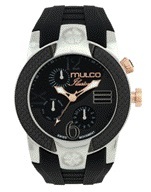 This entry was posted in Fashion Accessories, Watches and tagged Mulco, Mulco watches, watch, watches. Bookmark the permalink.